Welcome to my Go blog! Want to comment? Go ahead! June 25: What is a rule? June 9: Do game rules matter? May 29: Maximum number of strings? White to play, no komi, no prisoners. It is, however, a heuristic, and is sometimes broken. For example, if you apply it to Black in this problem (goproblems.com problem 4751), Black dies. Yet Black can live unconditionally. The answer involves double ko, so you can see why an absolute ko move restriction would miss it. In a ko threat counting sense, although it is unconditionally alive, life in double ko can be even weaker than mutual life in seki, which is weaker than real two-eyed life. All ko threats can be removed from a two eyed group. Seki will always leave behind one unremovable ko threat, although it's a point losing threat. And double ko leaves behind an infinite supply of ko threats which do not cost points (although in this problem the double ko can be removed after an additional black move). Finally, while we're on the subject of ko, the whole basic concept of a ko fight, as seen on the Ko page, for example (the sequence ko capture, ko threat, response, recapture, threat, response, recapture etc.) is a heuristic. You can't always ignore the opponent's response to your ko threat -- the response might threaten something else, another move may have become more urgent, or there may be some kind of battle over future ko threats that needs to be fought. Moving again is not necessarily just wasting a ko threat. Implicit in the immediate recapture model is an assumption about the nature of ko threats, that, once responded to, they need no further moves. I think this is what Bill Spight calls a "neutral threat environment", where each side has a supply of threats of various sizes, each threat requiring a single response, after which the position becomes cold. It's a useful assumption to simplify the local study of the ko itself, but the real game is more complex. The .75 komis are Chinese stone counting, so 2.75 corresponds to 5.5, 3.75 with 7.5. NS means No Significant difference from 50%. This data shows that Black has an advantage for komi 4 to 5.5. I think everyone knows that, thus the move to 6.5 in Japan, 7.5 in China. It seems to work too: 6.5 / 3.75 have more White wins than 5.5 / 2.75. Is 6.5 komi even, then? It looks like Black has a slight disadvantage, winning 48.8%, but it's not significantly different than 50%. The 95% confidence interval runs from 46.8% to 50.9%, so a lot more data (20,000 games, perhaps) will be required to see if this disadvantage is real. And it's not like there's a whole lot of room between 5.5 and 6.5 to tweak the number further. The other thing I find interesting is the "extra bit" in territory scoring, sometimes said to make the game under Japanese rules more subtle and sophisticated than under Chinese. This bit isn't there at komi 5.5 (see /July 2003), and indeed, 5.5 and 2.75 have very similar outcomes. The question is, do 6.5 and 3.75 differ, as you'd expect from the extra bit? I get p = 0.06 in a chisquared test, so they haven't been shown to be different, not significantly, not yet. Still, it looks like there's a komi under Japanese rules which equalizes the colors, and none under Chinese. Maybe I'll actually have to sit down and understand Japanese rules one of these days. Whether go moves, positions, problems, games and collections could be subject to any intellectual property rights has been an oft-debated question, with few hard answers. K. F. Lenz has added fuel to the fire in the form of a book chapter on the subject. Although written in german and specific to Japanese law, it may carry weight given his stature as a professor of law. His position, if I understand the babelfish correctly, appears to have changed to support copyright of game records. Interesting, especially for those who live in Japan. Just back from a holiday. 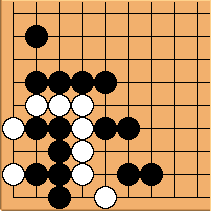 I didn't play any go, though I did a few more C-level problems from the Segoe-Seigen books. And I did play a game called "Sand go", whose rules shifted as continually as the sands we drew the board in. My opponent was generous with help, though. You can take my move back, and change it to your color? Okay. I can't go there, it's your territory? All right. What's territory again? I see. Can I make two moves in a row too? Oh, good! It was a driving trip through British Columbia, so we saw a lot of trees. On the Sunshine Coast on the mainland, we saw regrowth forest, logged a century ago. Mixed into the environment of tall, full trees were improbably large stumps. When we finally saw climax old-growth forest, on the west coast of Vancouver Island, on the verge of Clayoquot Sound, it was amazing. It was much lighter near the forest floor than younger forest. The trees are far apart, allowing light and moisture to reach down to the depths. There is no real bottom, no visible dirt, perhaps like ocean: just different layers, with different living things depending on the character of light and moisture at each level. Everything was growing on another living thing: logs, live trees. It's not easy for me to understand cutting these trees. The rainforests were harvested by men who understood the ages of the trees: one ring per year, hundreds or thousands of rings. They were proud of it, though. A B.C. cigarette ad showed a group of 19th century loggers posing inside the notch of the huge tree they were about to fell. It's a bit like the big game hunters or fishers posing with their kill, except that game animals and fish regenerate in decades, not centuries. It's the hunter part of being human, and it continues. You can make nice things with old wood. The kaya trees from which fine go boards are made must be 800 years old to be large enough to harvest, and are quite rare in the proper part of Japan. A permit is required for each one cut down, no doubt specifying the use to which it will be put. Ending up as a fine go board seems like a nice way to go, even if it's just a conversation piece for some rich businessman. Still, I look at wood differently now, think about where it came from. Kind of like fur and leather. It's good to be respectful of the origins of things, when you can. The Volokh conspiracy has a post on defining the nature of rules. Excerpt: "The more I think about it, the more I think that a rule means a prescription for action that relies on an intermediate degree of abstraction. When rules become either too abstract or too situation-specific, they begin to lose their rule-like character." Go rules fans and theorists take note. Absolutely, says one blogger in a damning indictment of the rules of Quidditch. I'm not sure what's weirder: a serious analysis of the rules of a purely fictional game, or the fact that likely more of the world's population is familiar with those rules than go. I finished a game on DGS recently, a 13x13, my first on a board larger than 9x9. It took a little over two months. My opponent, rated somewhat lower than me, had two stones, but I felt like he was in control for the entire game. He might well be stronger than me, despite what the ratings say. And while there are various places where each of us could have done better, he really made only one mistake. Unfortunately, it resulted in a moderate hunk of stones getting chopped off and killed. White won. Mistakes are what drive results. David Fotland, to improve at tournament go, started thinking before each move "Is this the losing move?" He credits this with adding a stone or so in strength, a huge jump given he was already a mid-dan. Robert Jasiek, in his advice for improvement, dispensed with the usual syllabus and gave only two: life and death, and avoiding mistakes. Your strength of play is defined by your worst moves, not your best. The Japanese tradition emphasizes the ordinary, the routine. If you can make 150 ordinary moves in a row, without slipping in something wacky or stupid, then you are very strong. This attractive black string has 229 liberties. The theoretical max, for a board with 361 points, is 241. Is it possible to get any more onto 19x19? Total number of strings is 275, or about 76% of the number of spots on the go board. Without edges, you can get up to 80%, using the repeating unit in the middle of the board. I don't think more are possible, for the borderless case. Should you always capture once to use up a threat or should you always remove double threats before you first capture the ko? Should you leave local threats for last, because you should play the smallest (effective) threats first, and local threats are effectively infinite, or should you play them first, because they are only threats in the context of this ko? Go is a complex game with simple rules, or so the sales pitch goes. Most statements of the rules don't come off as simple, however, so lots of people have tried writing simpler versions, of which the Tromp-Taylor rules are probably best known. It's probably a purely intellectual exercise, as there aren't any disconnected desert islands of would be go players out there, just waiting to be introduced to the game by a leaflet in a bottle. Still, it's a fun exercise. I'd like a simple ruleset which fits on a business card, along with a small but playable go set. Here's an attempt, based on no-pass go with prisoner return. Equipment. 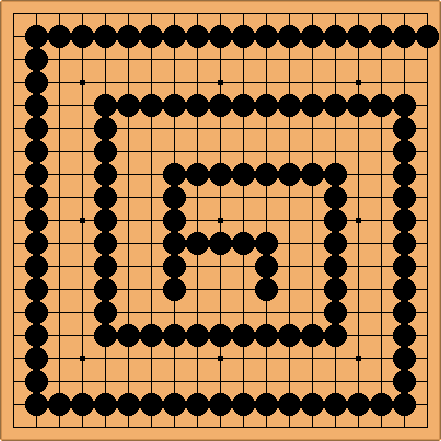 A rectangular grid, initially empty, and enough black and white stones to fill the grid. Play. Two players take turns placing stones of their color on intersections of the grid. Black begins. Groups. All stones of the same color connected by lines are part of the same group. Empty intersections adjacent to a group along the grid lines are the liberties of the group. Capture. After placing a stone, a player collects all stones in opponent groups with no liberties remaining as prisoners. Prisoners are removed from the board and kept by the capturing player. No suicide. It is illegal to play a stone which would have no liberties, after removal of any captured prisoners. Ko. It is illegal to make a play which repeats a previously occuring position. End of game. During their turn, a player must place a stone on the board or pass by returning a previously captured prisoner. A player with no legal moves on the board and no opponent prisoners to return loses. Their opponent wins. Equipment: A square grid; enough stones to cover each intersection on the grid, 1/2 of the stones should be black and 1/2 should be white. 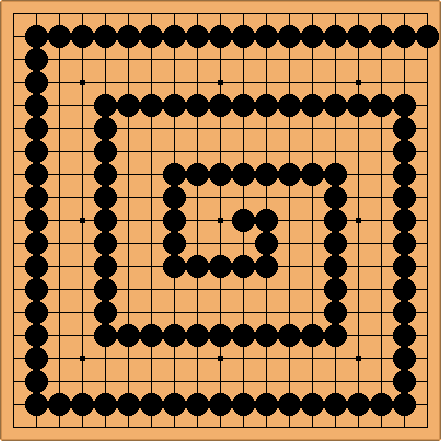 Turns: Players take it in turn to place a stone on any empty intersection of the grid; black plays first; In lieu of playing a stone, a player may pass. Groups: Any stone on an intersection horizontally- or vertically-adjacent to a stone of the same colour is in the same group as that stone. Liberties: Any intersection with no stone placed on it which is horizontally- or vertically-adjacent to a group is a liberty of that group. Territory: Any empty intersection which can be connected to one of your groups by following the lines is a point in your territory. Capture: If you play on the only liberty of one of your opponent's groups, you capture that group and take the stones in that group as prisoners. Suicide: You may not play a stone which reduces the number of liberties of your own group to zero, unless the stone so played captures some of your opponent's stones. Ko: You may not capture a stone if the stone you captured was the last move played and it captured a single stone. End of the game: If both players pass in succession or either player runs out of stones, the game is over. Score: Your score is the sum of the number of points of territory you have, and the number of stones you have captured. Result: The winner is the player with the highest score. Hmmm, a little longer than I was hoping for. I think my rules are less ambiguous than those you give, and will not require that every possible point be played in order to give a fair result. As far as etiquette, I love comments, and I'm also fond of the basic ko rule. Japanese style rules normally say what happens to capturable stones left on the board after both players pass, since having to remove them costs points. Defining capturable is what usually takes up all the airtime in Japanese rules. Your territory definition seems to include dame and points in seki, but I don't have a problem with that. You also might want to clarify that you can't follow lines through stones. From http://www.mathpuzzle.com/go. If W a, then the result is B+4 (area scoring). There's supposed to be a better move, attributed to Bill Spight, but I can't seem to find it. Help? It seems to me that is key. If at a, the result is B+4. Instead of B connecting at a, how about a hane and starting the ko in the upper right? Black can't win it, but White doesn't have enough liberties to stop Black from creeping around the edge. 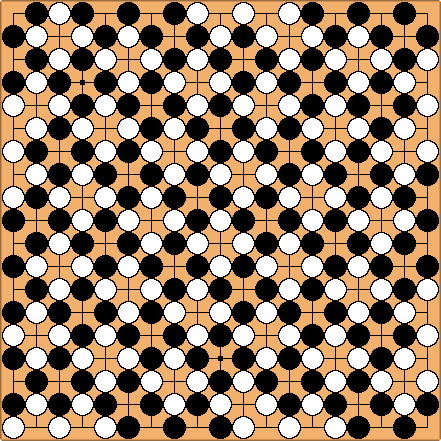 The final result is B+1 with White alive and Black in seki. White could atari at b to win the ko in the upper left, but this costs three points for a gain of two, so the result would be B+2. unkx80: I think you are right. Guess I overlooked this. What's the smallest board that can support three groups with two full eyes? Of square boards, 6x6 can do it (it can hold four groups of two eyes, actually), but 5x5 can't. Of rectangular nonsquare boards, 2x10 has the smallest area, and 5x6 has the smallest long dimension. The arrangement on 5x6 has essentially no wasted space (none at all if you ask that both sides play the same number of stones) and looks difficult to improve on. On boards which can't support three two-eyed groups, stone scoring and area scoring are equivalent. The next question would be what size is required before three groups happen with reasonable play. It happens often enough on 9x9. I missed my blog's anniversary, which happened on May Day. Oops. Hopefully it will forgive me -- there are worse anniversaries to forget. I've now been at this for a year, which is longer than I'd expected. I'd assumed that I'd run dry, get bored, or get busy, long before now. Fortunately or unfortunately, that hasn't happened yet. I haven't even finished the topics that first drove me to blog: capturing race theory, ko. I haven't even started on ko. As far as I know, I was the first go blogger, (or perhaps the first go blogger to call it a blog), but there are now a small crowd of us, some here on SL, some elsewhere, tracking our thoughts and progress, writing about go. I don't know if blogging is making me stronger, probably the opposite, but at least I'm having fun. Arno: you are an unsung hero :-) Congrats.